Hello again! I recently participated in the RNGEternal Eye of Winter Classic. While I sadly did not make top eight, I did get close, but no one wants to hear some report about how some stock netdeck crushed all the fun decks in the event. Good thing this report is nothing like that! So the moment the Eye of Winter Classic was announced I went into a state of constant experimentation and testing which culminated in a hyper optimized deck...PSYCH. The deck was made at the very last moment before registration closed by me in a half asleep, sick state. I was originally going to go with LOA’s Sleepless Argenport but then decided to play something that screams fun. Thus, I threw together some cards and ended up at this deck, Unstable Sindok Control. Now in my half asleep sick state I did more than just throw random cards together. There is an interesting combo in the game. There is only one ten drop in the game and that is Scourge of Frosthome . By cheating out Sindok, Rage Incarnate through burn and/or units and waiting a turn you can lock your opponent out of spells. The deck has a lot of inevitability with its alt wincons such as Flamestoker and the plethora of burn spells. As for the sideboard its mostly normal stuff like counters, protection, and hand/deck attack. 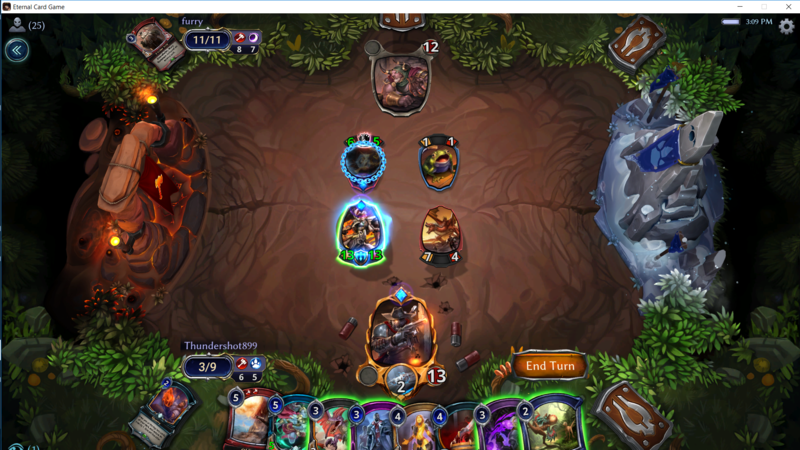 The two copies of Knucklebones are for matchups the Sindok combo is ineffective against the opponent like Stonescar Rally. My first opponent was Firething25 on Praxis Midrange. I learned over the course of the day that Praxis is probably one of the worst matchups for the deck. The combo barely hurts it, the alt wincons are easy for it to remove, and it is so flexible hand attack does not give you any time. Also my opponent sided in slows which turn out hurt a lot. My sideboard plan of more removal did not help much. I quickly lost 0-2 against the plethora of large units and burn spells so the meme deck started 0-1. The next person I faced was this guy named “Bye” on some weird 150 card max power singleton combo aggro control deck. Oddly before I could even challenge him he sent me a message telling me he could not dare get in the way of such a beautiful deck. Round 3: Lights Chicken Action! The match that made me write this in the first place due to popular demand. This was a streamed match between me and my teammate Angrychicken on TJP Control. He was not on chalice this was a unit light Stronghold's Visage deck. This is the kind of match I wanted, a slow game where the combo and burn swing the game in my favor. The game was quicker than I thought it would be with my Flamestoker putting a lot of pressure on Chicken. There was a turn where I casted Unstable Form on an Infernus . I had ZERO idea what would happen, if you unstable form a screamed unit it gets sacrificed so I was hoping it would not work like that. Likely it worked normally. For my sideboard plan I brought in a bunch of deck and hand attack along with Eliyn’s Favor s to keep my combo safe. Game two started with me power screwed against an army of frogs. I eventually used Unstable Form to cheat out a North Wind Herald which let me cheat out two Sindok, Rage Incarnate s shortly after. Much to my horror one of the frogs turned into a Cult Aspirant while Chicken had a Visage out. I got the the combo off twice and got rid of his channel, rain, and Sword of the Sky King with my various hand and deck attack cards taking the game 2-0. 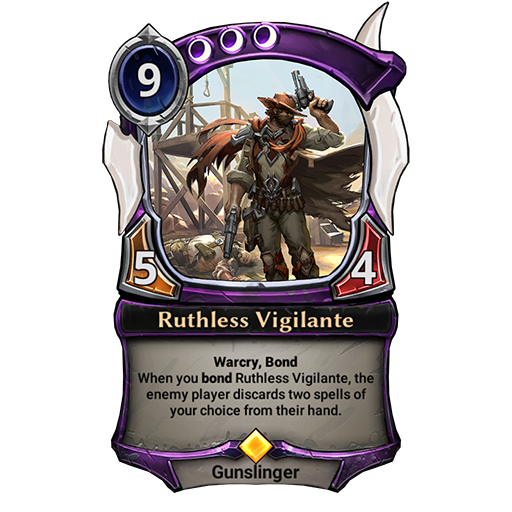 Next was Sneaky on Stonescar Aggro. Game one was uneventful, I tried to stay alive and lost very quickly to the swarm of units. For game two I did something really weird, I took out unstable form and Sindok instead putting in Rain of Frogs, Kaleb’s Choice, and Knucklebones. My logic is this, the unstable combo is so bad against them using Knucklebones to get units to block is much better. Sadly I quickly lost game two putting me at 2-2. Furry on Stonescar Aggro was my next opponent. I was not that happy after my last match put on the bright side I had my sideboard plan already together. So we started and somehow I managed to beat him game one. Game two got into the very late game and I got to play not one but TWO Knucklebones. Off the value from them I was able to get a second win in amazing fashion. Icaria with warcried Diving Rod getting a Sindok made by Knucklebones. Even when I side it out Sindok never leaves me. Don’t trust me? Well I took a screenshot! Next was Solarflare/Alpacalips who was on Dark Combrei. Throwing a lot of burn at him got a quick win for me. Game two he overwhelmed me with his units. Game three was much like game one where Flamestroker and burn made me win the match. While a match nothing super crazy happened there was a fun solution I came up with. I dealt with multiple titans by unstabling them, then permafrosting them. 4-2 going into the final round one more win and I might be able to top 8. My final opponent was Cogito on Praxis Midrange. Somehow I got a win against him game one then disaster happened. Game two I got stuck on four again two titans in a row leading to a quick loss. Then game three I got flooded and faced turn three and four titan again. It was not all bad, I learned a lot of the faults of the deck. If I had to change anything about the deck for tournaments it would be more polymorphs and less Unexpected Results. There are a lot of titans and not a lot of very slow control decks. It was fun to write another article and I wish all who use the deck luck in the future. I would like to thank Stevercakes for letting me write this article and Flash, Darkness, and Bradykin for editing. Why do you have to wait a turn after playing the Sindok, Rage Incarnate before you can Unstable Form? Maybe I'm missing something.